Iowa Poet Laureate, playwright, and BEI Emerita Fellow Mary Swander will moderate a discussion following staged readings from her plays Vang and Map of My Kingdom. Sponsored by Scattergood Friends School. “Boycott! 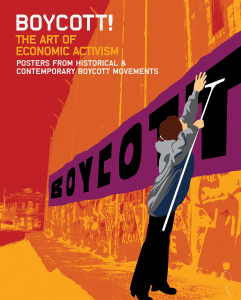 The Art of Economic Activism features poster art from more than 20 movements from the 1950s to the present, including the Montgomery Bus Boycott, United Farm Workers’ grape and lettuce boycott, divestment from South Africa to protest Apartheid, boycotts of corporations using sweatshops, the Palestinian call for Boycott, Divest and Sanctions (BDS), and many others. Activists and solidarity groups have often responded to injustices by implementing boycott and divestment campaigns targeting companies and governments that support and sustain these injustices- and posters have been a primary tool for educating about the issues and inspiring people to action. This exhibition uses powerful posters to demonstrate the effectiveness of boycotts as a nonviolent tactic to end injustice and oppression. Register for Event: Iowa Poet Laureate, playwright, and BEI Emerita Fellow Mary Swander will moderate a discussion following staged readings from her plays Vang and Map of My Kingdom. Sponsored by Scattergood Friends School.